The Collective Security Treaty Organization (CSTO; Russian: Организация Договора о Коллективной Безопасности, Organizacija Dogovora o Kollektivnoj Bezopasnosti, ODKB) is an intergovernmental military alliance that was signed on 15 May 1992. 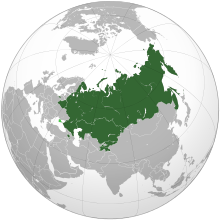 In 1992, six post-Soviet states belonging to the Commonwealth of Independent States—Russia, Armenia, Kazakhstan, Kyrgyzstan, Tajikistan, and Uzbekistan—signed the Collective Security Treaty (also referred to as the "Tashkent Pact" or "Tashkent Treaty"). Three other post-Soviet states—Azerbaijan, Belarus, and Georgia—signed the next year and the treaty took effect in 1994. Five years later, six of the nine—all but Azerbaijan, Georgia, and Uzbekistan—agreed to renew the treaty for five more years, and in 2002 those six agreed to create the Collective Security Treaty Organization as a military alliance. Uzbekistan rejoined the CSTO in 2006 but withdrew in 2012. Nikolai Bordyuzha was appointed secretary general of the new organization. On 23 June 2006, Uzbekistan became a full participant in the CSTO; and its membership was ratified by the Uzbek parliament on 28 March 2008. It suspended its membership in 2012. 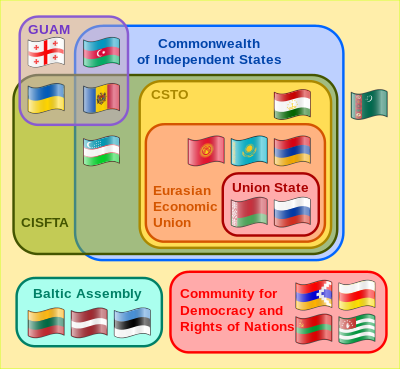 The CSTO is an observer organization at the United Nations General Assembly. The CSTO charter reaffirmed the desire of all participating states to abstain from the use or threat of force. Signatories would not be able to join other military alliances or other groups of states, while aggression against one signatory would be perceived as an aggression against all. To this end, the CSTO holds yearly military command exercises for the CSTO nations to have an opportunity to improve inter-organization cooperation. A CSTO military exercise called "Rubezh 2008" was hosted in Armenia, where a combined total of 4,000 troops from all seven constituent CSTO member countries conducted operative, strategic and tactical training with an emphasis towards furthering efficiency of the collective security element of the CSTO partnership. The largest of such exercises was held in Southern Russia and central Asia in 2011, consisting of more than 10,000 troops and 70 combat aircraft. In order to deploy military bases of a third country in the territory of the CSTO member-states, it is necessary to obtain the official consent of all its members. In May 2007 the CSTO secretary-general Nikolai Bordyuzha suggested Iran could join the CSTO saying, "The CSTO is an open organization. If Iran applies in accordance with our charter, we will consider the application." If Iran joined it would be the first state outside the former Soviet Union to become a member of the organization. The CST was set to last for a 5-year period unless extended. On 2 April 1999, only six members of the CST signed a protocol renewing the treaty for another five-year period – Azerbaijan, Georgia and Uzbekistan refused to sign and withdrew from the treaty instead. At the same time Uzbekistan joined the GUAM group, established in 1997 by Georgia, Ukraine, Azerbaijan, and Moldova, and largely seen as intending to counter Russian influence in the region. Uzbekistan later withdrew from GUAM in 2005 and joined the CSTO in 2006 in order to seek closer ties with Russia. On 28 June 2012, Uzbekistan suspended its membership in the CSTO. Member nations adopted measures to counter cyber security threats and information technology crimes in a Foreign Ministers Council meeting in Minsk, Belarus. Foreign Minister Abdrakhmanov put forward a proposal to establishing a Cyber Shield system. During 2005, the CSTO partners conducted some common military exercises. In October 2007, the CSTO signed an agreement with the Shanghai Cooperation Organization (SCO), in the Tajik capital of Dushanbe, to broaden cooperation on issues such as security, crime, and drug trafficking. On 29 August 2008, Russia announced it would seek CSTO recognition of the independence of Abkhazia and South Ossetia. Three days earlier, on 26 August, Russia recognized the independence of Georgia's breakaway regions of Abkhazia and South Ossetia. Since 21 December 2011, the Treaty parties can the veto the establishment of new foreign military bases in the member states of the Collective Security Treaty Organization (CSTO). Additionally, Kazakhstan took over the rotating presidency of the CSTO from Belarus. During a trip to Ukraine to extend Russia's lease of the Crimean port Sevastopol in return for discounted natural gas supplies, Russian President Dmitry Medvedev was asked about whether Belarus could expect a similar deal and responded, "Real partnership is one thing and a declaration of intentions is another; reaching agreement on working seriously, meeting each other halfway, helping each other is one thing and making decisions about granting permanent residence to people who have lost their job is another." The Belarusian President defended himself against this criticism by citing former Russian President Vladimir Putin's invitation of Askar Akayev to Russia after he was ousted as President of Kyrgyzstan during the 2005 Tulip Revolution. The following month, President Medvedev ordered the CEO of Russia's natural gas monopoly Gazprom to cut gas supplies to Belarus. Subsequently the Russian television channel NTV, run by Gazprom, aired a documentary film which compared Lukashenko to Bakiyev. Then the Russian President's foreign policy adviser Sergei Prikhodko threatened to publish the transcript of a CSTO meeting where Lukashenko said that his administration would recognize Abkhazian and South Ossetian independence. ^ Obydenkova, Anastassia (23 November 2010). "Comparative regionalism: Eurasian cooperation and European integration. The case for neofunctionalism?" (PDF). Journal of Eurasian Studies. 2 (2): 91. doi:10.1016/j.euras.2011.03.001. ^ Sputnik (22 July 2008). "Former Soviet states boost defense capability in joint drills". ^ J. Berkshire Miller, The Diplomat. "Russia Launches War Games". The Diplomat. ^ a b Vladimir Radyuhin. "CSTO tightens foreign base norms". The Hindu. ^ "Gendarme of Eurasia – Kommersant Moscow". Archived from the original on 1 February 2014. ^ "Kremlin announces that South Ossetia will join 'one united Russian state". ^ "CSTO Security Councils Secretaries meet in Yerevan". PanARMENIAN.Net. ^ "Meeting of the Collective Security Treaty Organisation". President of Russia. ^ "Armenia to participate in Kazakhstan CSTO drills". Archived from the original on 14 August 2014. Retrieved 13 August 2014. ^ "Bordyuzha: CSTO ready to deploy its peacekeepers to resolve conflict in Ukraine". Archived from the original on 2 April 2015. Retrieved 21 March 2015. ^ Sputnik (4 February 2009). "CSTO's rapid-reaction force to equal NATO's – Medvedev". ^ Cases of cash paid for Kyrgyz unrest – former president Archived 19 June 2010 at the Wayback Machine, Russia Today, 17 June 2010. ^ CSTO Chief Says Foreign Mercenaries Provoked Race Riots In Kyrgyzstan Archived 6 July 2010 at the Wayback Machine, Eurasia Review, 1 July 2010. ^ Kyrgyzstan takes decision on deploying CIS police force in South[permanent dead link], Itar-Tass, 21 July 2010.